Apparently, this was the result of negotiated product placement, and was even designed and printed by USA Today in-house. Some of their predictions did not come true (Washington Prepares for Queen Diana’s Visit [pretty sure she wasn’t in line for the throne, guys]), some are a bit closer to the mark (President Says She’s Tired). I love (good) design, I love technology, and I love it when they can all combine together in a functional and beautiful whole. In this case: paper money (but for how long will we still be saying that?). And futuristic money movie props combine so many things into a perfect storm of my interests that I will turn the internet upside down and shake it looking for them. As a minor point of trivia, (higher denomination) US paper money combines four different types of printing: intaglio (most art, engravings), offset lithography (background tints, patterns, colors) letterpress printing (serial numbers and seals), and screen printing (color-changing inks). Additionally, it contains multiple advanced security features (IR & UV inks, magnetic inks, security threads, lenticular threads, etc). When BTTF II was filmed in 1988-89, copiers and color copiers were beginning to have a significant impact on counterfeiting. Only in 1990-92 were the first of the modern security features implemented: microprinting and the security threads. However, a 1985 study recommended a security thread, and holograms (if feasible in the near future). Someone on the BTTF II crew did their homework (or maybe they just went to DC, or a Federal Reserve Bank), and the original concept art for the dollars of 2015 shows many advanced features and serious design changes that A) were being contemplated that that time, B) make sense, and C) would even be adopted well before 2015. A) Security threads? – Yes, 1990-92. B) Off-center, enlarged portraits? – Yes, 1995-96. C) Enlarged numerals? – Yes, 95-96. D) Barcodes? Not by 2015. The Dutch added serial number barcodes to their banknotes in 1989. The Canadians added simplified barcodes to their notes in 1986, but these only encoded the denomination, not the serial number. E) Braille? Not by 2015. F) Hologram strip? Partial credit – Motion strip, 100’s only, 2013. G) MICR / OCR serial numbers? Not by 2015. Ironically, the technology used in the current $100’s (Motion) is almost exactly the same thing used then in the pink hoverboard’s background (lenticular plastic + printed pattern = 3D effect). So, they had to use one of these awesome bills, the product of so much research and design effort, right? As far as I can tell, that’s an absolutely normal 1988 $50 bill. Zemeckis, you are killing me. Why, why, why? 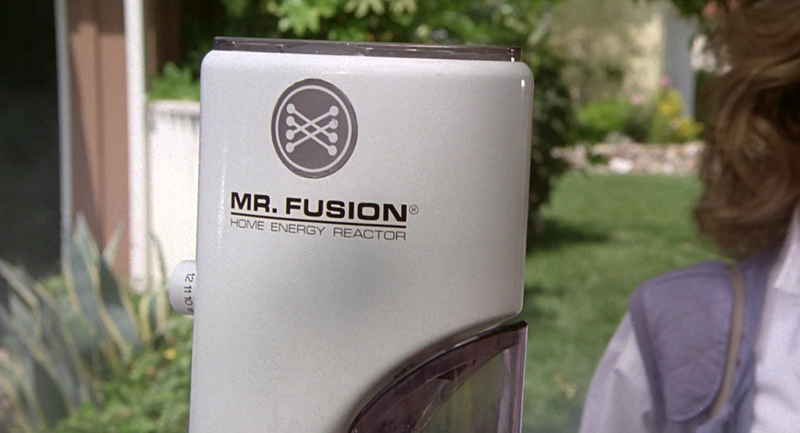 What you may not notice immediately, is that this was going to be a piece of product placement sponsored by Westinghouse. Note the suspiciously similar logo? Forgot where I snagged that art from; sorry. Additionally, the name was a play on the then popular “Mr. Coffee” appliance, also referenced in Spaceballs’ “Mr. Radar.” As a third-level coincidence, this piece of the car is in fact made from an old coffee grinder made by Krupps. The same coffee grinder was also used as set dressing in the kitchen of the Nostromo in Alien. Keep your eyes peeled at those yardsales, kids. 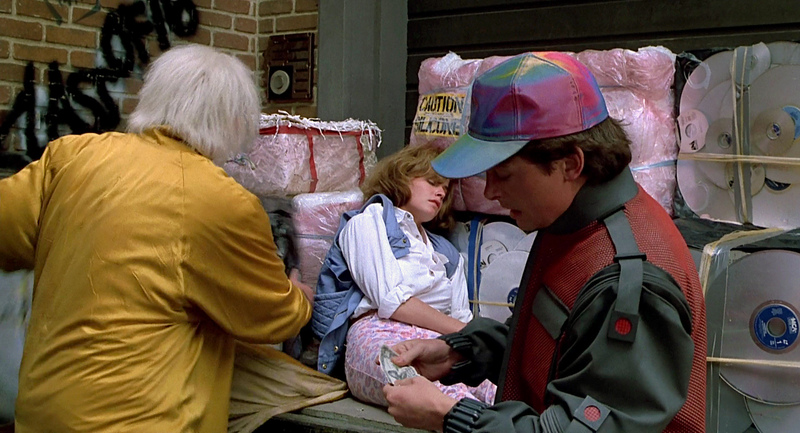 Coming Soon: BTTF II 2015 Posts! Mostly gonna be HD screencaps of the good bits. Possibly including TERRIBLE REVELATIONS! 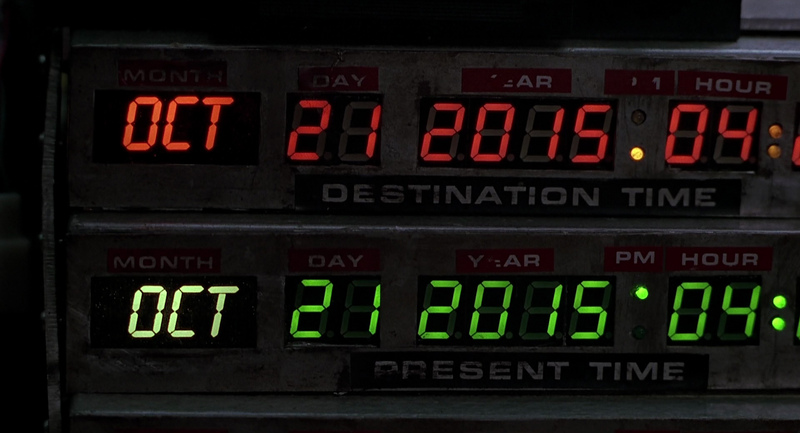 Author Staff WriterPosted on October 20, 2015 Categories UncategorizedTags 2015, Back to the Future, BTTF, Doc Brown, Hill Valley, Marty McFly, Where's my Flying Car?Leave a comment on Coming Soon: BTTF II 2015 Posts!